After 37 days without a drop of rain, six-tenths of an inch fell on my garden yesterday, slowly enough to soak into the ground without much runoff. At last–a reprieve from watering! The only upside to the prolonged drought has been excellent fruit setting on my tomato plants. No rain means that the tomato flowers are open for pollination all day, and no rain means the bees are out doing their work nearly all day. Pictured is a single day’s harvest from my eighteen currently productive plants (after I gave some away). So now that the tomatoes are rolling in, what to do with the torrent of red fruit? BLTs for breakfast, caprese salads for lunch, cherry tomatoes & feta for a snack: I’m eating and giving away tomatoes as fast as I can, but the tomatoes are gaining on me. Mainly because I don’t bother with canning tomatoes, and I don’t like to use fresh, “real” summer tomatoes in a heavy, long-cooked sauce. My goal is to use them all in a fresh state, as close to raw & delicious as possible. A quick search through my shelf of Italian cookbooks uncovered Marcella Hazan’s Spaghettini col Sugo di Erbe e Pomodoro Crudo (p 140 in Marcella’s Italian Kitchen), which might rate this summer’s honors as the best uncooked tomato sauce. This simple preparation preserves the tomatoes’ fresh color, texture, and taste, while tempering their acidity with hot olive oil and a shower of fresh herbs. Happily, I had all of the ingredients growing right outside my back door. A bonus for the impatient cook: the sauce is easily prepared while the pasta cooks. Halve the tomatoes, squeezing out the seeds with your hands. Chop the de-seeded tomatoes into 1/2-inch or smaller pieces. 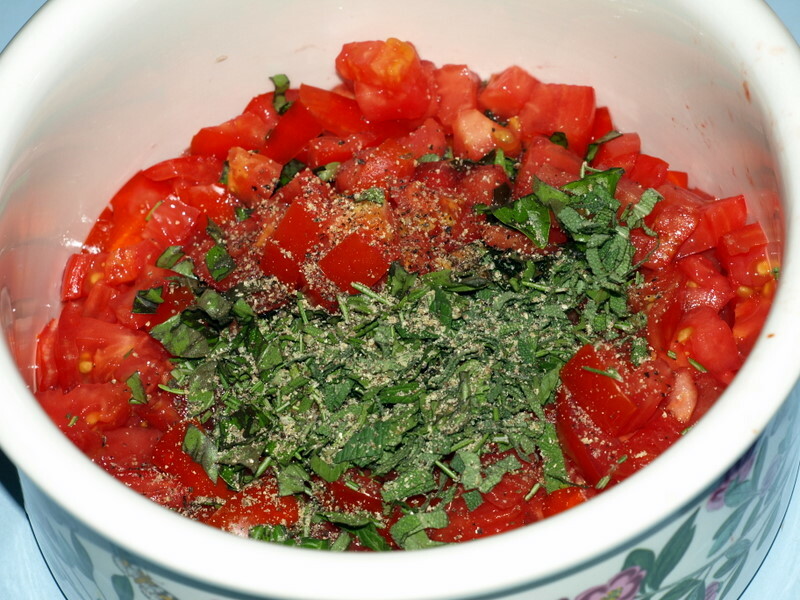 Place the chopped tomatoes and chopped herbs into a heat-proof serving bowl large enough to accommodate the cooked pasta. In a small saucepan, heat the olive oil until it is very hot (at least 375, as hot as for frying). Carefully pour the hot oil over the tomatoes; it should hiss and sizzle. Quickly stir the hot oil into the tomatoes and sprinkle on salt and black pepper to taste. Meanwhile, cook the spaghetti in rapidly boiling water and drain when it is still al dente. Add the cooked pasta to the tomatoes, using tongs or two spoons to mix thoroughly. Serve while still warm. So beautiful! I have only one plant so far that has started to produce ripe fruit. It’s the Chadwick Cherry, with tomatoes that are two to three times the size of cherry tomatoes I’ve raised before (but not especially sweet — wish I had some Sweet 100s). There are lots of green ones on other plants that should start to ripen within a week or so. The Evergreen plants succumbed to some sort of droopy blight. I am not interested in canning tomatoes either, but I have preserved them in other ways. Last year I dried, and then froze, many tomatoes. I have done this for years at a low temperature in the oven, but last summer Jamie made me a dehydrator that is essentially a stack of framed screens that can be clamped together, thus protecting the fruit from insects while it dries. In the Arizona sun this takes no more than two days. If you’ve been having dry, hot weather it should work for you as well. I also roasted and froze some, and they tasted wonderful with pasta in the middle of winter. Toward the end of the tomato season when I had no time or patience for any of this I froze some Romas whole in bags, and they worked fine in cooked sauces. I have blanched/peeled, then frozen tomatoes before. It’s probably the easiest way to deal with excess tomatoes. RE: drying, it will never-ever be dry enough here to accomplish tomato-drying outdoors. My metal patio furniture is growing moldier as we speak, and we are in the midst of a drought. Those tomatoes would be stinky before the end of day 1. 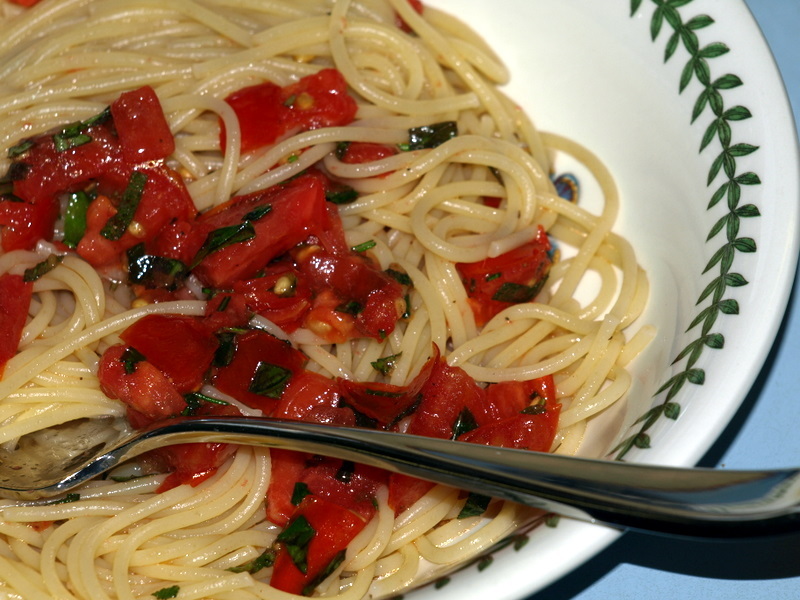 I’ve made a dish similar to this with the fresh tomatoes, too, and it is wonderful. It’s breakfast time here, and I’m still wishing I could dive into that pasta! So envious of your homegrown tomatoes–I have only a shady suburban yard, so must settle for some herbs and no conspicuous veggies. 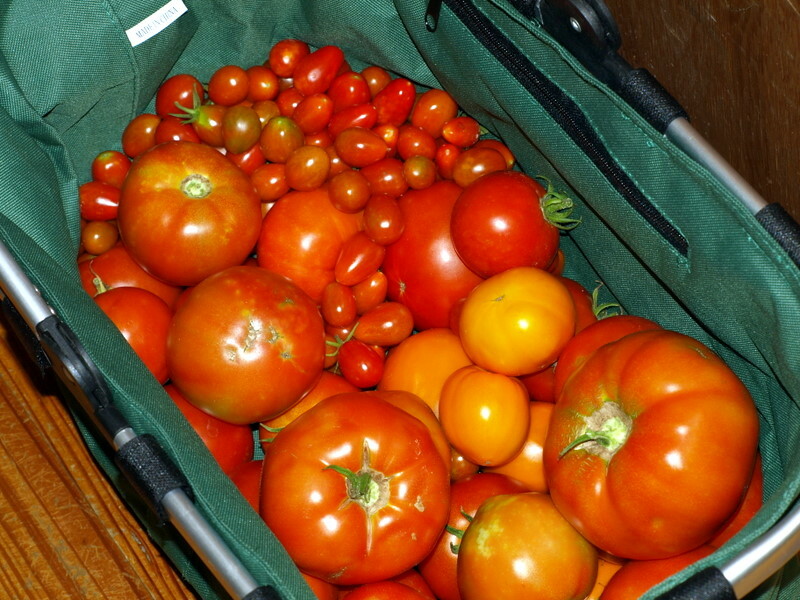 Plus, even if I did have tomatoes, they wouldn’t be ready here in MD till July! Shady gardening is a challenge, isn’t it? My very oddly shaped raised bed is strategically positioned to capture the only full-sun patch in the backyard. By July, it will be too hot for most tomatoes here. I did plant a few “Solar Fire” tomatoes last week, in hopes of extending the season a bit longer. Our nighttime temps stay above 70 degrees from mid-June, so the plants grow fine, bu they won’t set any fruit. On another subject, though I am jealous of all your tomatoes, I want to learn to cook Thai. Any books you can recommend? The high-water mark for Thai cookbooks is David Thompson’s Thai Food, but it is not quick and easy. He makes all of the spice/curry pastes from scratch & suggests the use of a mortar & pestle. I so want a plate of that spaghetti! My MIL taught me to blanch the tomatoes, skin them, quarter them and freeze them in gallon freezer bags (can toss in some onions, too) to use later. They do very well in the freezer and it’s so easy to pop a bag of them into a saucepan to create a fresh-tasting dish. Please put me on your list of people to foist tomatoes onto. That looks good……….thinking of Semolina’s Pasta Chicago right now. I will take any tomatoes off your hands! I have one lone tomato and lots of little, yellow flowers but that it is all.